The Putter Wheel System comes with 3 Putter Wheels, our unique 2 line alignment template and a soft microfiber pouch to carry the system. PUTTING IS HALF THE GAME: 18 holes X 2 putts per green = 36 strokes = Exactly ½ of par 72. Enough said. 1. Line of SIGHT The narrow width of the PutterWheel's patent pending shape trains your eye to see a direct track to the hole. 2. SETUP The PutterWheel¿s red sidewalls help you align your body and distance to the ball so that your eyes are always directly above it. See red and you know you are too close or too far from the ball. 3. STROKE Feedback Training: The PutterWheel AMPLIFIES any error in your putting stroke by wobbling and curving off your clubface. 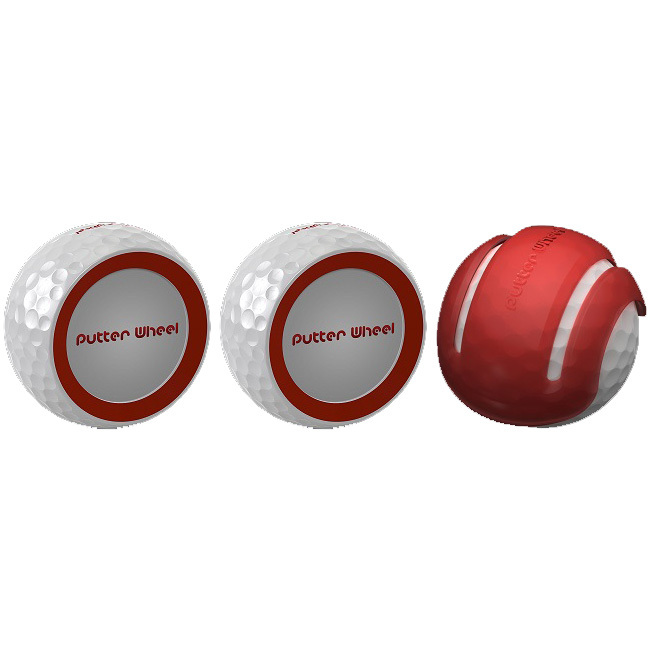 TAKE IT TO THE COURSE The alignment template creates 2 parallel lines on your game ball identical to the width of the PutterWheel. Take your improved line of Sight, Setup and Stroke with confidence to the course!The Putter Wheel System comes with 2 Putter Wheels, our unique 2 line alignment template and a soft microfiber pouch to carry the system.